The Department of Geodesy and Surveying of BME joined in 2014 to "Geo for All" which is a joint initiative of OSGeo (Open Source Geospatial Foundation), ICA (International Cartographic Association) and ISPRS (International Society for Photogrammetry and Remote Sensing). "Geo for All" is specialized in teaching and researching in several open source topics. Our laboratory participates in the daytime education of undergraduate and postgraduate students, and announces short courses to interested people. We took part in the OGRS 2018 with a presentation about our open source Ulyxes project. The development platform of our Ulyxes open source project has been moved to Python 3, while the Pytohn 2 compatibility is preserved. 3.0.2 version of GeoEasy has been released. This is a feature enhace and bugfix release. Binary versions, source code. New Windows binary development version is available for those who would like test the software before release or would liketo use the newest features, bugfixes. New version of Bulk vector export QGIS plug-in has been released. 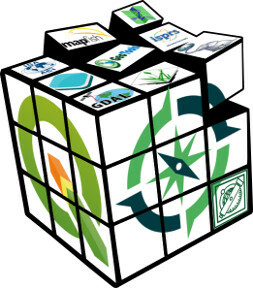 See QGIS plug-in repository and GitHub. Gábor Remetey Fülöpp has became an ambassador of the Geo for All network by the request of Suchith Anand, the founder of the network. Geo for All, OSGeo, FOSS4G were promoted at The Day of the European Surveyor and GeoInformation event on 22nd March. We got the Lab of the month reward in August 2016. OSGeo is 10 years old. Happy birthday! Presentation held on FOSS4G Europe 2015. We were represented on the Debrecen GIS conference by a presentation and a poster. We take part in the organizing commettee of the workshops of the FOSS4G 2015 Europe conference. Our Lab was represented on the 13th gita conference in Eger. Photos are available in our gallery. News about our new laboratory on the web page of the Faculty of Civil Engineering. We organized FOSS4G-HU for the third time. The presentations can be found on the homepage of the event. Copyright (c) 2013-2014 Department of Geodesy and Surveying. All rights reserved!